Red Letters Studio designs and builds simple and beautiful interfaces, creates eye catching logos, and conducts a smattering of other business relating to making stuff look good. See what’s been done before and get in touch if you would like something created just for you. I’m Josh. Right now I’m living by a beautiful lake and some golden cornfields in Iowa. Its definitely not heaven, but its still a pretty cool place to live and work. Make sure you wave next time you fly over! I’ve been creating stuff ever since I received my first box of Crayolas and it is what I absolutely love to do. For the past 10 years, web sites, logos, and other media have left my computer and have made some really cool people happy. I’m really passionate about creating content that is professional, easy to use and beautiful to look at. Get to know me if you want. I’m a friendly guy that really likes my church, my family, the Broncos, and potatoes. I would love to do some quality work for you. 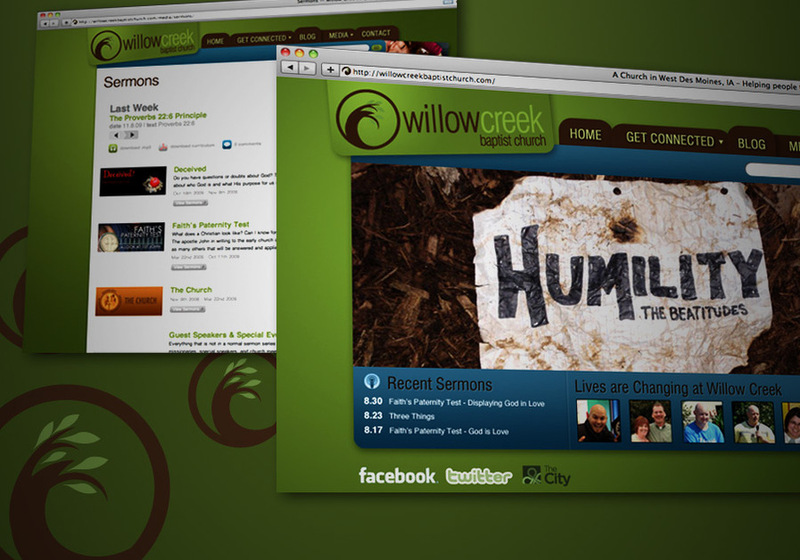 My latest project was for Willow Creek Baptist Church - They wanted a completely fresh look (including logo). The site has tons of functionality and is managed completely by WordPress.